One of the questions that often comes up when developing with IBM Cloud is “How do I schedule tasks?” If you are using IBM bare metal servers, the answer is fairly simple: Use cron or a similar scheduler. But if you are using the IBM Cloud platform as a service (PaaS), the answer is a little more involved. The IBM Cloud PaaS doesn’t have a system scheduler like cron. 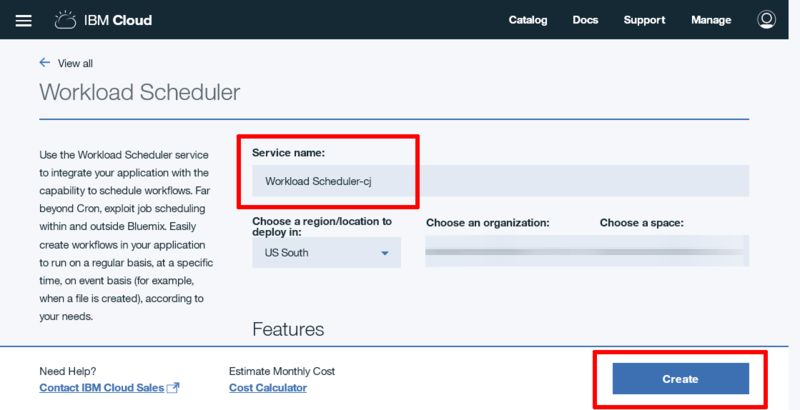 Instead, it offers the Workload Scheduler service, which is a special service instance you can connect to your IBM Cloud application. This service instance allows you to define custom processes that run on a pre-determined schedule and can be integrated with a variety of other tools, such as Cloudant, MQTT, Hadoop, and OpenWhisk. In this tutorial, I introduce you to the Workload Scheduler service with a real-world example: saving a daily backup of an application database. By working through this example, you’ll understand the steps involved and can adapt them to meet your own use cases for process scheduling. For applications that see a lot of activity, it’s important to maintain a regular backup of application data. Most of the time, that data is stored in a database, but it may also take the form of file assets or activity logs. Depending on the volume of data being generated, backups may need to be taken hourly, daily, weekly, or at custom intervals. For this example, I assume that the application’s data is stored in a MySQL database and that this data needs to be backed up daily, as an SQL file. For safety, the backup should be stored separately from the application itself. This example uses Dropbox as the backup storage area, but you can use any storage service, including IBM Cloud’s own Object Storage service. Once the necessary components have been downloaded via Composer, create the directories $APP_ROOT/public for all web-accessible files and $APP_ROOT/data for temporary storage, where $APP_ROOT refers to the application directory. Next, create the file $APP_ROOT/config.php file with the following information (you’ll fill in the placeholders as you progress). Log in to the Dropbox developer dashboard and create a new application by clicking Create app. Select the Dropbox API, set the type of access to App folder, and enter a name for your application, as shown below. Click Create app to create the new application. 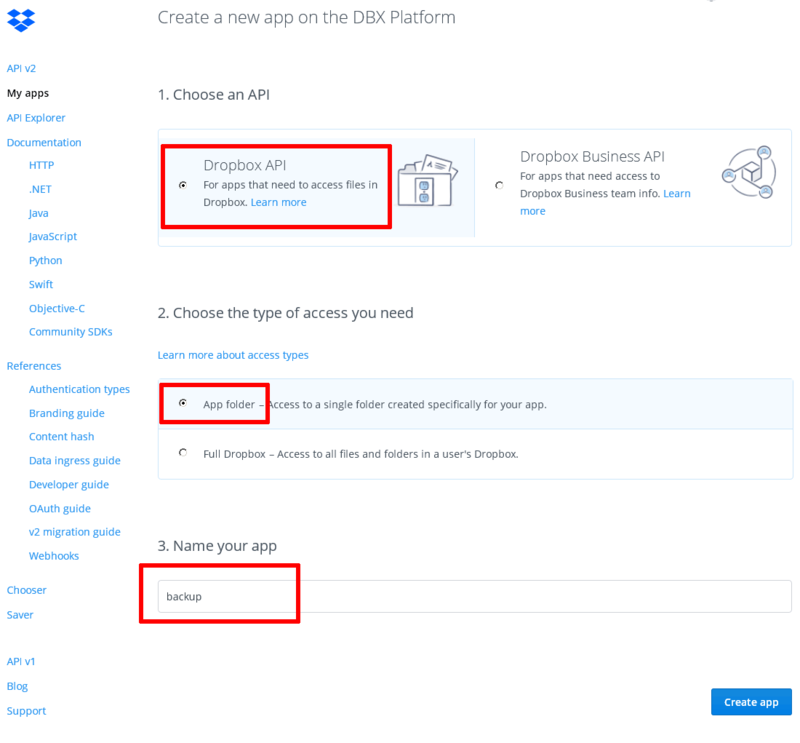 Once the Dropbox application has been created, you are redirected to the application settings page. This page displays an application key and secret. Note these values, together with the application folder name, and enter them into the configuration file from Step 1. Under ordinary circumstances, every access to the Dropbox API must go through an OAuth authorization process. However, in this case, because it will be your own trusted PHP script accessing your own account in the Dropbox API, you can bypass the normal authorization flow by creating an access token and using it in every request made to the Dropbox API by the PHP script. To do this, generate an access token from the application settings page and enter it into the configuration file from Step 1. Important: Do not share the Dropbox access token and application secret with anyone. To send email notifications, the PHP script needs to use the SendGrid API. SendGrid provides a PHP SDK that can be used for this purpose. To use it, you must first obtain a SendGrid API key. Log in to your SendGrid account and browse to the Settings > API Keys menu. Click Create API Key. Enter a name for the API key and choose the Full access option. Click Create & View to generate the key. Note the API key (it will be displayed only once) and enter it into the configuration file from Step 1. This is a good time to specify the recipient email address for status notifications in the same configuration file. You are now ready to begin building the PHP script that will work as a REST service and perform the backup. Use the code below, which should be saved to $APP_ROOT/public/backup.php. $filename = '../data/' . $config['settings']['db']['name'] . '‑' . $uploadedFile = $dropbox‑>upload($dropboxFile, "/" . "Your database backup was successful. Your backup filename is: " . throw new \Exception('SendGrid failure, response code ' . The script begins by loading the Composer auto-loader, which takes care of loading all the necessary dependencies, and the configuration file. Next, it looks for an incoming POST request in JSON format. If a request is found, it looks for a 'token' key in the request. The supplied token is matched against the token specified in the configuration file. The request is processed further only if the tokens match. This provides a minimal layer of security and ensures that only valid requests are accepted. Assuming a valid request, the script initializes the MySQLDump-PHP client and connects to the target database using the configured credentials. The client’s start() method is then used to export the contents of the target database to an SQL file, which is (temporarily) stored in the data/ directory. The script then initializes the Dropbox PHP API client, using the Dropbox authentication credentials from Step 2. The client’s upload() method is used to transfer the SQL file from the data/ directory to the application folder on Dropbox. The temporary file is then deleted. Finally, the script initializes the SendGrid PHP client using the SendGrid API key from Step 3. It creates a new SendGrid/Mail object by specifying the sender address, recipient address (obtained from the configuration file), subject, and body. The body includes a status message and the filename of the generated SQL file on Dropbox. The client’s post() method is then used to transmit the message through SendGrid’s servers. The script terminates with either a 200 (OK) or 500 (error) HTTP response code. You can specify them as static values in the application configuration file created in Step 1. If using this approach, go ahead and add these values to the configuration file. 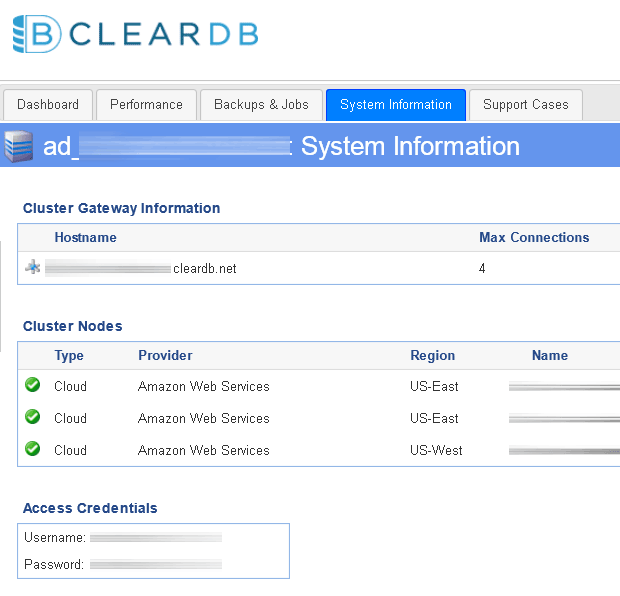 Remember that you can obtain the necessary credentials from the Credentials page of the database instance in the IBM Cloud dashboard or third-party dashboard. Alternatively, you can import the needed values from the IBM Cloud environment by connecting the corresponding database service to the application. If using this approach, add the following lines to the PHP script in Step 4, before the try block (you may need to use different JSON keys depending on the service you’re connecting to; this example uses ClearDB). By default, the configuration file created in Step 2 includes a simple authentication token. This token is used to validate incoming POST requests. You should update this token to a different value known only to you before deploying the script. You can deploy this script as a standalone application, to back up a single application database. This is the deployment option covered in the remainder of this section. You can bundle this backup script as part of a larger application. In this case, move the backup script from Step 4 to your application’s public-facing directory and re-deploy the application as usual. 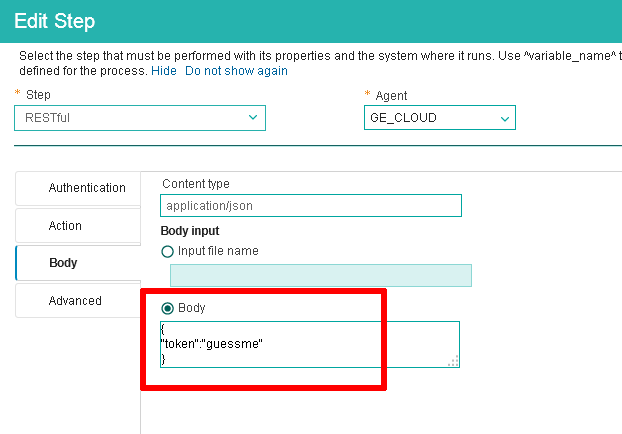 Note that in both options, you can connect the database instance to your application and read key variables (such as database credentials) directly from the IBM Cloud environment instead of using a configuration file. Refer to Step 5 for details on how to do this. First, create the application manifest file, remembering to use a unique host and application name by appending a random string to it (such as your initials). If you’re planning to read the target database’s credentials directly from the IBM Cloud environment, and you have made the necessary changes to the PHP script as shown in Step 5, bind the database service instance to the application. Remember to use the correct ID for the service instance to ensure that the right instance is bound to the application. You can obtain the service ID from the service instance page in the IBM Cloud dashboard. 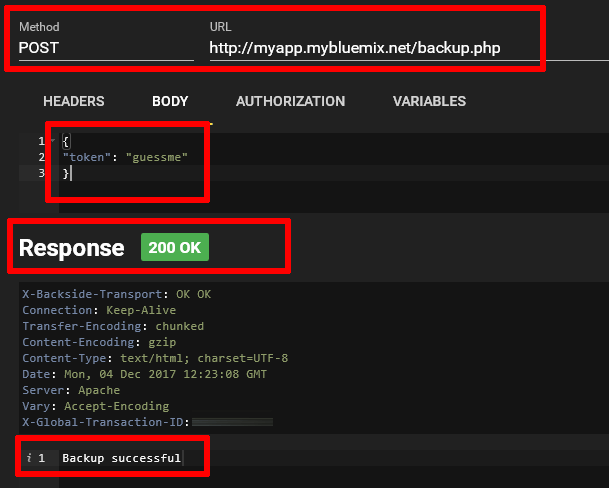 shell> cf bind‑service myapp‑[initials] "[database‑service‑id]"
If all goes well, the PHP script should perform the backup and respond with an HTTP 200 success code. In case of an error, the response will be an HTTP 500 error code and the response output will include a description of the error. If the backup succeeds, you should be able to see the SQL file in your Dropbox application folder. In case of an error, you can debug the script using “Debugging PHP errors on IBM Cloud” (see “Related topics” below). Log in to the IBM Cloud dashboard and click Create resource. From the Application Services section, find and create a new Workload Scheduler instance using the Standard plan. Launch the service instance by clicking Launch on the service detail page. Accept the terms and conditions to proceed. Select the My processes folder on the left and click New to create a new process. Define the new process as follows: a. In the General tab, enter a name for the process and specify the period during which it is valid. b. 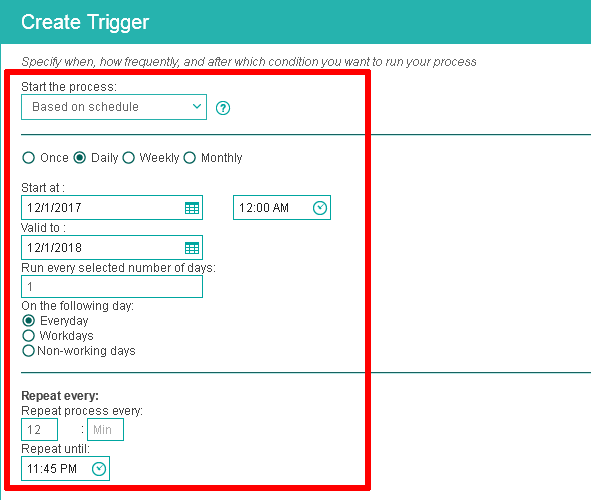 On the Triggers tab, click New and define a schedule for the process by specifying the frequency (once, daily, weekly, or monthly), the start and end day, the start time, and the repeat interval. c. On the Steps tab, click New and define a new RESTful step. In the Action section, enter the public URL to the PHP script and specify the method as POST. In the Body section, specify the request content type as “application/json” and create a JSON document containing the token as the body content. Click OK to save the changes, then click Enable to enable the process in the process library. The Workload Scheduler should now run the process on the defined schedule, invoking the REST endpoint and creating a fresh backup of the database each time. The History tab of the process can be used to monitor process execution. 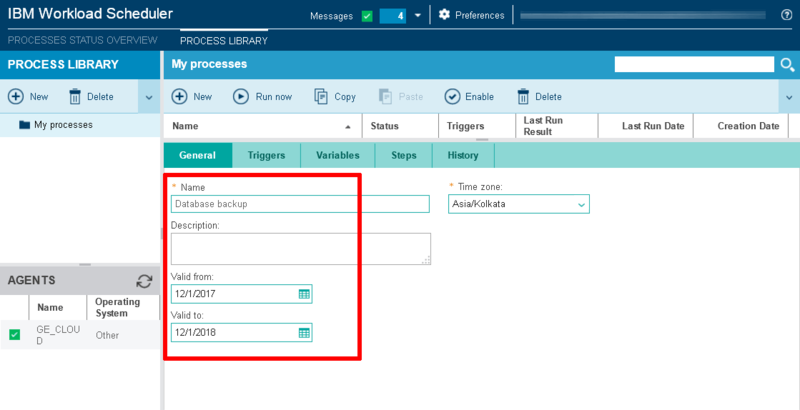 This tutorial explained how to schedule tasks on IBM Cloud. I considered a common use case — performing a regular backup of application data — and described how to satisfy it with an IBM Cloud Workload Scheduler instance and a REST-accessible PHP script. I used two external services — Dropbox for file storage and SendGrid for notification delivery — to illustrate how you can use the Workload Scheduler to harness both IBM Cloud services and third-party services to execute tasks on a recurring schedule. Obviously, this tutorial covers just one possible example. You could use the process outlined here to perform other scheduled tasks, such as sending daily activity summaries, cleaning up unwanted files, archiving logs, and so on. The PHP script used here is available on GitHub for you to use as a starting point. Try it and then start modifying it for your specific requirements. Happy coding!